The world-renowned Mayo Clinic has been using 3-D models since 2008, while planning an operation to separate conjoined twins. Since then, doctors across all specialities have found ways to apply 3-D models. The organisation now uses the technology on a broad spectrum of activities, including but not limited to patient education and surgery preparation. 3D-printing is slowly but surely finding its place in the world. It can be found in the aerospace industry, the food industry and the art industry. Mayo Clinic, however, uses the technology to drive forward their knowledge of the human body and surgery. They are not alone in this venture: according to a report from Allied Market Research, 3-D printing in health care is expected to be a $2.3 billion business by 2020. The technology proves to have many applications in the medical world. At the 3-D printer labs at Mayo Clinic, surgeons and doctors are educating themselves more and more using 3D-models. The new technology makes it possible for surgeons to understand the complex anatomy of a patient’s body, which helps them anticipate problems before getting to the OR. This means that they are often able to make smaller incisions and work faster, since they know what to expect. To create a model, patient data —specifically the imaging data from CT or MRI scans— gets imported into 3D printing software. Eventually, this will produce a 3-D models that is identical in size and shape to a patient’s body parts. This does not only educate surgeons, it also opens up the conversation with patients. MRI- and CT-scans are often hard to understand, while 3D-models make it possible to truly discuss surgery and its risks. The Mayo Clinic doesn’t stop there. Other than anatomy models for surgical planning and education, 3D-printing paves the way for patient-specific surgical tools and patient-specific implants. Other activities at the Mayo Clinic include research, quality control, simulation, prototyping medical devices, bioprinting and cell scaffolding. 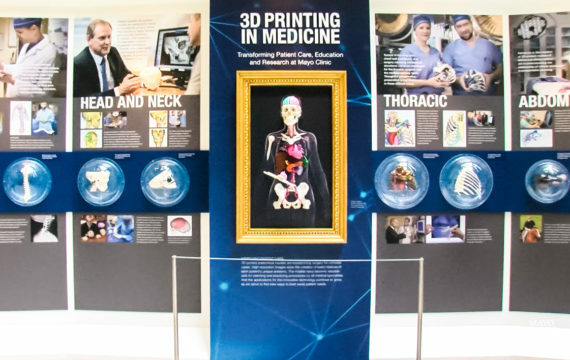 The Mayo Clinic also offers the ‘Collaborative 3D Printing in Medical Practice’, a post-graduate course designed to update and introduce radiologists, surgeons, dentists, biomedical engineers, and other health professionals and administrators on uses of 3D printing of anatomic models. Obviously, 3D-printing does come with certain challenges. As is the case with most new technologies. A notable problem is the time is takes to print a model. The organisation has to scan each patient to get the necessary patient data. And after this ordeal, the model has to actually print, which can take a long time. Especially during these early stages, since printers simply aren’t that fast yet. Other problems are in-hospital infrastructures, which influences the ordering, delivering and sterilization of models and software. For Mayo Clinic, however, these problems are certainly worth it. After all, 3D-printing could result in a more patient-centric medical world.